JASMINA Anema's Bone Marrow Drive March 7, 2009. March 7th,2009. New York City. I was pleased to be amongst the 1600 New Yorkers to participate in the bone marrow drive that took place at P.S.41 school (116 W. 11th Street, Manhattan), in hopes of finding someone who may be a match for kindergarten student Jasmina Anema. She is suffering from a rare and deadly form of leukemia. My friend Barry Klarberg and I got our cheeks swabbed in hopes that one of us might be the match needed to save Jasmina's life. It was very touching to see how many people care and how organized the volunteers were. Jasmina, who just turned six, is adopted, so her doctors are unable to turn to blood relatives for bone marrow transplants and her family and friends have been trying to draw attention to the drive. 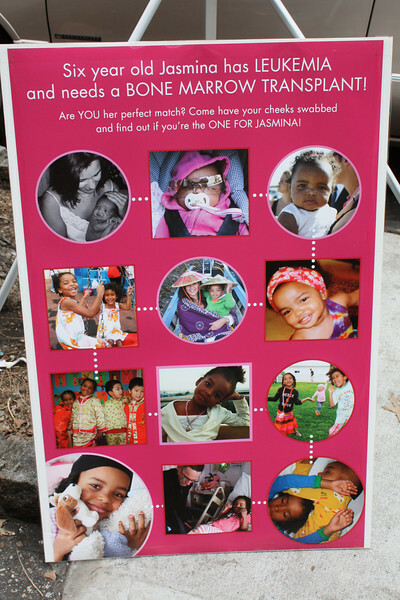 To learn more please go to her website http://www.oneforjasmina.com. Her mother said earlier this week, "I need thousands of people to come," and called Jasmina, who was three days old when she was adopted, "the love of my life." The drive is also to raise awareness about registering as a potential bone marrow donor. Actress Jill Hennessy (Law & Order, Crossing Jordan), whose son attended school with Jasmina and who was one of the many P.S. 41 parents who helped organize the drive said,"I'm blown away by the number of people who came to help Jasmina. It shows what kind of wonderful community we have here in New York City." Other celebrities involved are Rihana; who first brought Jasminas plight to the public, New York Knicks center Chris Wilcox, Paul Pierce of the Boston Celtics and Tyson Chandler of the New Orleans Hornets, some have visited Jasmina in the hospital. Grammy award winning singer Kelly Rowland made a very special visit to Jasmina's NY University hospital room on her sixth birthday and spend hours with her. She sang Happy Birthday to Jasmina and decorated cupcakes. If you want to sign up to be a donor, you can do so by mail (check over the eligibility requirements). There is also a donor kit available by mail. Katharina Harf of DKMS Americas, a non-profit organization that helps people find bone marrow matches was quoted, "It's very hard for African-American patients to find a matching donor, because they are under-represented on the national registry and their tissue type is more varied, so it's very hard to find a donor." Jamina's mother Theodora Anema was amazed at the turnout and told the News, "This is beyond anything I could have imagined." Two months ago Jasmina's mother took her to the doctor for a cut on her toe that would not heal. That was what led to the discovery that she has leukemia. For more information about becoming a bone marrow donor, contact http://www.DKMSamericas.org , a non-profit marrow donor center: 866.340.3567. Some donor candidates paid a voluntary $65 to cover costs others who could not pay made contributions. Once registering data is entered into the National Marrow Donor Program registry, in anonymous form, so doctors can search for a donor for their patients. Each year more than 140,000 peoiple are diagnosed with leukemia, lymphoma and other Blood cancers. Leukemia is the most common disease children in the U.S. die of, a bone marrow transplant may be their only chance to live. Only 2 out of every 10 patients will receive the transplant that could save their lives.